The story of Yellowstone’s thermal basins begins with features deep within the earth. At the center of the earth is the core which is surrounded by the mantle and finally the earths crust. But what interest us is a feature known as a hotspot. It is a source of immense heat anchored within the mantle. This same hotspot is responsible for volcanic active in a number of areas in southeast Idaho including Craters of the Moon National Monument. After millions of years of movement of the earths crust this hotspot now lies beneath Yellowstone. About 600 thousand years ago this hotspot sent a column of hot magma toward the surface forming a huge magma chamber. As the magma chamber filled it pushed upward on the earths crust forming a large dome. As pressure built on the surface, cracks formed around the edge of the dome and a huge eruption expelled a tremendous amount of magma emptying a large portion of the magma chamber. With the removal of hundreds of cubic miles of molten rock, the roof of the dome collapsed in what was one of the most violent explosions the earth has ever known. Lava continued to flow into the caldera for the next 500 thousand years filling much of crater. 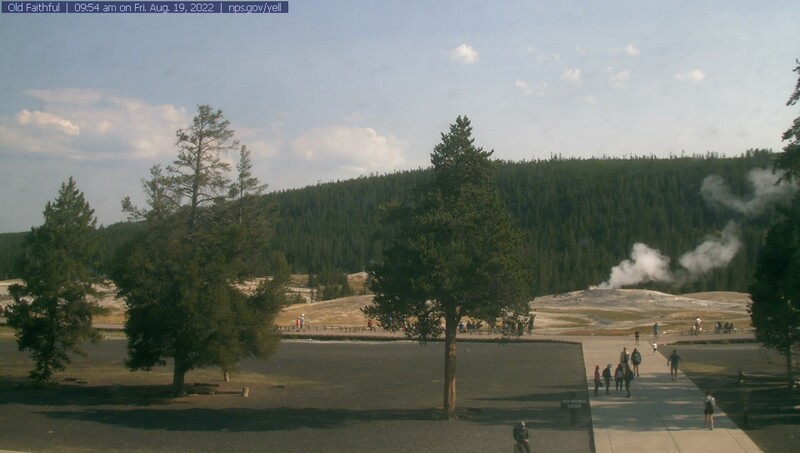 It is this still active volcanic area that provides the heat source for Yellowstone’s thermal features.